Since 1870 specialized in national and international removals from our office in Zoetermeer. "Do your job well and the customer comes back" is our simple philosophy in which we firmly believe. Henneken is the relocation specialist when it comes to moving to and from the UK. From office relocation to schools and government institutions, they all come to Henneken. Save space, time and money for your company and use the storage services of Henneken. 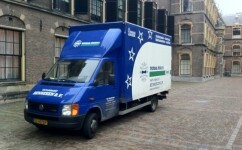 Established in 1870, Henneken Movers is one of the oldest removal companies in the Netherlands. From the beginning we have adhered to a simple philosophy that we firmly believe in: "if you do a good job you will see your customers back". This is exactly why we see so many loyal customers returning and putting their trust in us when it's time for them to be on the move again. Henneken represents quality and reliability - thanks to our employees' dedication and hard work. We handle more than 1,000 removals every year - both within The Netherlands and to and from destinations abroad. Our broad experience has given us the flexibility to see to your personal wishes in a proactive way. If you choose Henneken your goods will be in good hands. Henneken is the specialist of choice when it comes to removals to and from England, Ireland, Scotland and Wales. Every year we conduct approximately 300(!) removals to and from these destinations. Read More..
Henneken's quality system has been certified in accordance with the strict ISO 9001 standards. We owe our good reputation to our longstanding and continuous commitment to professionalism. This creates obligations. That reputation needs to be maintained by delivering a high service level time and again.